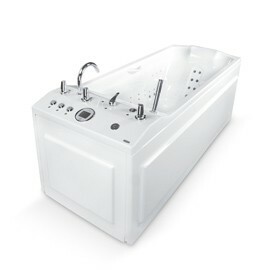 Orionmed is a professional, multifunctional hydrotherapy massage tub used for such treatment as whirl massage, pearl bath- and automatic hydromassage. Orionmed is water-economical and easy to use thanks to its high-tech touch panel, automatic settings and thus utilization of the newest technology. Orionmed is highly recommended especially for beauty- and hydrotherapy centres or home use. pearl bath hydromassage (using bottom holes). Filling / draining time: approx. 4 min.